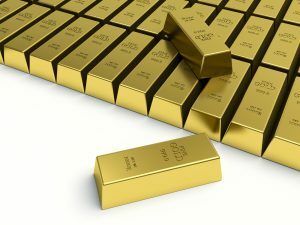 When the next market crash occurs, global gold investment demand will likely overwhelm supply, and gold will surpass its previous high of $1,900. This has happened before. Two of the highest quarters of gold ETF demand occurred when the broader markets crashed in 2009, and the 10% correction occurred in 2016. Physical gold demand shows how much fear there is in the market. With the amount of leverage and debt now in the system, when the market crashes, it will push gold investment demand up to unheard-of levels. Assuming current market conditions, investors will purchase about 1,050 tonnes of physical gold and 250 tonnes of gold ETFs (1,300 tonnes). However, the next market crash could push gold demand to 3,000 tonnes. The price will rise as available supply vanishes. We could see $2,000 gold as the stock market crashes by 25% to 50%. The gold price surged by $200 when the Dow fell by 11% in Q1 2016; today, it’s a different ballgame. Not only is gold trading at $1,300, the Dow is 6,000 points higher. If the Dow experienced another severe correction, gold could move up by $200. What happens when the markets tank? And what about gold demand? We could see gold investment demand surpass 3,000 tonnes when the stock market crashes, and there won’t be supply. The highest annual total net gold investment was 1,730 tonnes in 2011, including 1,498 tonnes of bar and coin and 232 tonnes in gold ETF demand. There was no stock market crisis in 2011, so gold ETF demand was normal. When total global gold investment demand surges to 3,000 tonnes in one year, it will put pressure on available supply. The annual gold supply is about 4,500 tonnes (not including jewelry, technology, and central bank demand). If we experienced 3,000 tonnes in total gold investment and added all other demand, it would equal 5,500 tonnes—1,000 tonnes more than supply. The world has never suffered a 1,000-tonne deficit. This is why central banks make sure investors put their funds into the greatest paper Ponzi scheme in history rather than in gold. All Ponzi schemes collapse, but a 2,000+ year history of gold won’t.